The new site for the body representing all councils in Australia’s largest state is located in Perth, it features 2000sqm of terraced gardens, a public walkway and a boutique childcare centre. Among the clean and green innovations are highly efficient ventilation systems and lighting, as well as solar technology capable of delivering about 30 per cent of peak power requirements. The environmentally friendly home of local governance is the result of a joint venture between WALGA and Qube Property Group, with WALGA retaining a 60 per cent stake in the ambitious plan costing over $45 million. Designers expect the five-storey beacon of efficiency to attain a five star rating from the Green Building Council of Australia. “As the peak body of local government, we wanted to demonstrate leadership for the sector,” WALGA business solutions manager Nick Wood said. “The days of building a brick box which has very poor energy ratings, very poor water efficiencies and doesn't provide a healthy workplace have come and gone. 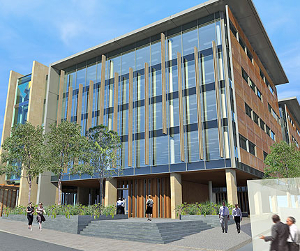 WALGA and Jardine Lloyd Thompson, its partner in Local Government Insurance Services, will move into one part of the ONE70 building, the remaining office space will be available for lease.